Santa brought me an iPad for Christmas. I L.O.V.E. it, whether it’s just for putzing around on social media, checking emails, or watching something on Netflix. While we were at Staples, Gil and I walked by a Microsoft Surface tablet which looked totally awesome as well. The touch-screen interface is really unique and it can even run Microsoft Office! Well, this month, we’ve teamed up with an amazing group of bloggers to bring you a totally awesome giveaway. The winner of the February iPad/Surface Giveaway will get their choice of an iPad (RV: $499), a Microsoft Surface Tablet (RV: $499), or CASH!. 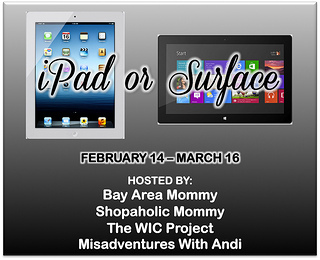 This month’s giveaway is hosted by us – The WiC Project – Bay Area Mommy, Shopaholic Mommy, and Misadventures With Andi! Enter below for your chance to win one of these amazing devices! Enter to Win Your Choice of iPad or Microsoft Surface Tablet! This giveaway starts on February 14, 2013 at 12:01am EST and ends on March 16, 2013 at 11:59pm EST. Open worldwide. Must be 18 years or older. Winner may opt for the cash equivalent if not in the US or Canada. Great giveaway – thanks for the opportunity! Thanks for the great tips and giveaways! Awesome giveaway! Thank you for hosting it and giving us a chance to win such an amazing prize! Thanks for the giveaway and all the work you put into your posts. I love your blog! Thank you for the wonderful giveaway! Happy Valentines Day! What an amazing giveaway! Thank you for doing this! Happy Valentine’s Day! Thank you for the awesome giveaway! Thank you for the awesome giveaway. Happy Valentine’s Day! You are so good to us…THANK YOU!!! 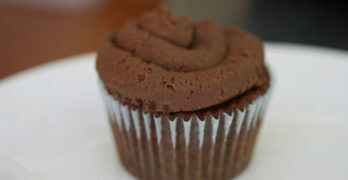 love the recipes and the giveaways! Thank you! Thank you for all you do all year, and thank you for this contest! Love your site, thanks for all you do! Hope you have a great night. Thank you for all that you do 🙂 Much apprciated! Thank you! HAVE A GREAT SATURDAY! I just love your blog! thanks for the great giveaway! Thanks for the giveaway. God bless you! I LUV Apple stuff. Thanks so much for the giveaway and all the good stuff in your blog. Love reading your posts.thank you for the chance to win a great prize. Have a blessed day. Thank you for the outstanding giveaway. Your blog is super! Could use this with two teenagers in the house. I love your blog, design, and giveaways. Thanks for offering a great giveaway- I’d love to win a tablet! Thank you for hosting a wonderful giveaway. Have a wonderful Wednesday! This is a great one thanks for hosting it! thank you so much, hope you are having a great week! So hopeful to win the iPad. I could use this in homeschooling my grandchildren. thanks so much for the chance..awesome giveaway! Something nice! JK! Thank you for this wonderful giveaway. Thank you so much for an awesome giveaway! Thank u for such a great giveaway! And thank u for all u do for all of us! Thanks for hosting this ipad giveaway. Awesome giveaway…Both are great tablets. Thanks for this giveaway. You’re a legend. great giveaway as always. Love your site. Hello-well it is March 4th (Monday)And I just wanted to wish you a blessed & wonderful month and thank you for all the hard work you bloggers put into getting those awesome giveaways out there for us sweepers. I love your blog — thanks for all your hard work! I really like the path you are taking to walk with Christ. You are a light to the world. May bessings rain upon you. More power to WIC Project! Keep doing what you do best. You’re bringing smiles to every one. Thank you for this awesome giveaway!! Have a wonderful weekend everyone! Thanks for the giveaway. I like giveaways with cash as an option for the winner. Thank you for this giveaway and for all the work you put into your blog. I love your blog template – very pretty! I really like your blog, so many out there – yours always brings me back! Thanks so much for this giveaway! I lit up when I saw this! Great blog. Great prize. Thanks for the giveaway. Thank you for the positive messages! I really love your blog! Thanks for the fabulous giveaway!